Hola, Mexico Mark Here. Search "Mexico Mark Rocky Point"
FYI THIS LISTING IS ALMOST 100% BOOKED FOR 2019 WITH THE EXCEPTION OF May 4,5& 6 weekend, OCTOBER, NOVEMBER AND DECEMBER . PLEASE SEE THE LISTINGS OF THE HOMES THAT ARE NEXT DOOR TO MY HOME, MY SISTER AND FATHER IN LAWS HOMES FOR SPRING 2019 AVAILABILITY. The minimum for any stay is $825.00 regardless of any discounts or credits, etc. My rate is 275.00 per night, for the first three nights and 250.00 for each night after that. Always include the number of nights in your inquiry regardless of credits, discounts, etc. The dashboard will try to calculate the correct rate but that is often wrong and I will adjust it and then respond with a phone call, text or email. Please remind me if you are a returning guest who has written a review and wants a free night. Unfortunately I can not give credit for the free night unless there are special circumstances. In an effort to minimize my billing efforts, I am asking that you pay in full if you are taking the fourth night free. If you need to make two payments then please just ask, I completely understand. Honestly, I have never kept anyones money if they just can't make the trip.The most punitive action is to give credit for future visits and that is only if the cancellation is within 60 days of the booked date. For returning guests who write a review, I offer a 'pay for three or more nights, get one free' deal. That is a $250.00 value if you are a returning guest, who has written a review and is paying for three nights @ $275.00/night. Or simply put, Four nights for the price of three. This is on a retro active basis for any of my previous guests and applies to any subsequent visits of those guests. To get this discount you must pay with a Personal check or Paypal. This 2000 sq ft Playa Dorada home is beautiful. It has fabulous beach sunsets and exceptionally big tide swings. The beach is full of sea shells and small sea life and Dolphin sightings are common while dining from the roof top deck. In town, shopping is great for all who like to bargain. There is plenty of golf at the nearby Mayan Palace or in town at Sandy Beach. The beds and linens of this home are extremely comfortable and much time and effort have been invested in the furnishings and decor. There is a hammock on the large back patio and beach toys for the kids. Because the house has four beds and four baths it is great for a couple of families or multiple couples. This is such a great value because we would rather offer a green, solar powered home than charge you more money. We have, however, recently tied into the Mexican power grid and use it when necessary. This will enable us to maintain the functionality of all of the ceiling fans and other electricity demands that exceed our solar usage. Please know that the home is not air conditioned and I typically will not rent it in July, August or September. I ask that you limit the number of occupants to eight because of our water management. First, water is trucked in and that is expensive. Second, all of the water goes to a septic system and it has a volume limit. Please have a conservative mindset when it comes to water usage. Please know that same day guest turnarounds are more of the rule than the exception these days so please check out by 10:30 am and check in no earlier than 2:30 unless you have made previous arrangements with me. I encourage all to post in my online guestbook by clicking on the review tab at the bottom of this page. When visiting our home, please feel free to take some refrigerator magnets. The magnets have our VRBO listing number and my phone number on them so feel free to give them to your friends and family. Because of the beautiful beach and sunsets. We enjoy the peace and quiet and the gentle roar of the ocean when we wake up in the morning. Beautiful sandy beach front. Huge tide swings. Please request a YouTube clip for explanation. I use a blue tooth receiver for content on my phone. There is a large, nice patio. One of the best features of the home. Our family enjoyed our stay at this home! The location was amazing, right on the beach, with soft sand and small dunes just off the patio which kept the kids entertained when not in the water. The water in front of the house is very shallow and rock-free when the tide is out, perfect for the little ones. We also enjoyed taking the kayak out and pulling the kids around on the large inner tube. We had the beach all to ourselves! We stocked up on groceries the first day so we could cook all our meals in the well-stocked kitchen without having to run the 25 minutes into town. There is some visible wear on the house but the location and amenities were exactly what we were looking for. We stayed in this home for 4 nights with a group of friends. While the house is a bit south of town 15-20 mins it was perfect for our group. The beds were comfortable with nice linens and having 4 bathrooms is ideal. I loved the large back patio, it is a very peaceful sitting and watching the sea, the gated neighborhood is exceptionally quiet. 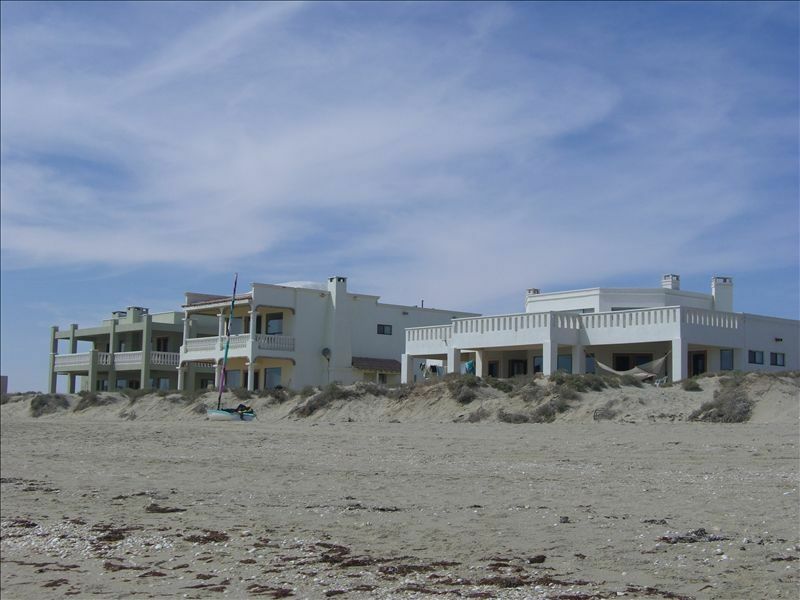 If you are looking for a big party home close to downtown Puerto Penasco this may not be your best option. If you are seeking a peacful, relaxing home that is in a quiet gated community this is certainly a good choice. We will return. Peaceful and relaxing. Had a great week. Would book again!! Great location on quiet beach with lots of sand. Beautiful views. Nice to have use of kayaks, boost boards and toys there. Beds were comfortable. Wonderful to be able to bring our dogs to the beach for the first time! Beautiful home on the beach! A fantastic time shared by 4 generations at this beautiful home! Quiet beach we had almost to ourselves. Dolphins every morning with an up close view from the kayaks. Hope to come back here very soon! Spacious, comfortable and amazing! Well appointed kitchen. Sea kayak and SUP. We had the beach to ourselves. This is our second stay at this property and we love everything about it! Due to communication policies within the VRBO messaging system I am unable to see your contact information until you have paid their fee which is in usually $100-$150 depending on the length of your stay. I have set up my payment schedule so that the first payment covers that fee plus five dollars. The reason for this is so that you can book for a minimal amount. After that, VRBO will supply your phone number and then if you have any questions or concerns we will be able to do discuss that with a phone call if needed. After all questions are answered then we can go forward and you will be asked to pay the balance 90 days prior to your departure.